And likewise, the Answer of Robert Reed, to the same Appeal. Thanks to the Bishop of Bangor, for his Sermon. Ordered, That the Thanks of this House be, and are hereby, given to the Lord Bishop of Bangor, for the Sermon by him preached before this House, on Wednesday last, in the Abbey Church, Westminster; and he is hereby desired to cause the same to be printed and published. Hodie 3a vice lecta est Billa, intituled, "An Act for explaining several Powers contained in the Will of William late Lord Craven, for making Jointures and Leases; and for rendering the same Powers more effectual, for the Purposes thereby intended." Watson's Petition referred to Judges. It is Ordered, That the Consideration of the said Petition be, and is hereby, referred to Mr. Justice Fortescue and Mr. Baron Wright; with the usual Directions, according to the Standing Order. E. of Bradford's Guardians Petition referred to Judges. It is Ordered, That the Consideration of the said Petition be, and is hereby, referred to the Lord Chief Justice of the Court of King's Bench and the Lord Chief Baron of the Court of Exchequer: with the usual Directions, according to the Standing Order. Keck's Petition referred to Judges. It is Ordered, That the Consideration of the said Petition be, and is hereby, referred to the Lord Chief Baron of the Court of Exchequer and Mr. Justice Fortescue; with the usual Directions, according to the Standing Order. Blacket & al. Leave for a Bill. Persons take the Oaths to be naturalized. John George Dolfuss, Anthony Aubert, Maurice Margarot, Anthony Laporte, and James Auriol, took the Oaths appointed, in order to their Naturalization. Vazielle & al. Nat. Bill. Hodie 2a vice lecta est Billa, intituled, "An Act for naturalizing Anthony Vazielle and Stephen Saintandre." Their Lordships, or any Five of them; to meet at the usual Time and Place, on Tuesday next; and to adjourn as they please. Ordered, That the Petitions of certain Persons to be added to the said Bill, which were ordered to lie on the Table till the same should be read a Second Time, be referred to the said Committee. Persons in America naturalizing Bill. Hodie 2a vice lecta est Billa, intituled, "An Act for naturalizing such Foreign Protestants, and others therein mentioned, as are settled, or shall settle, in any of His Majesty's Colonies in America." 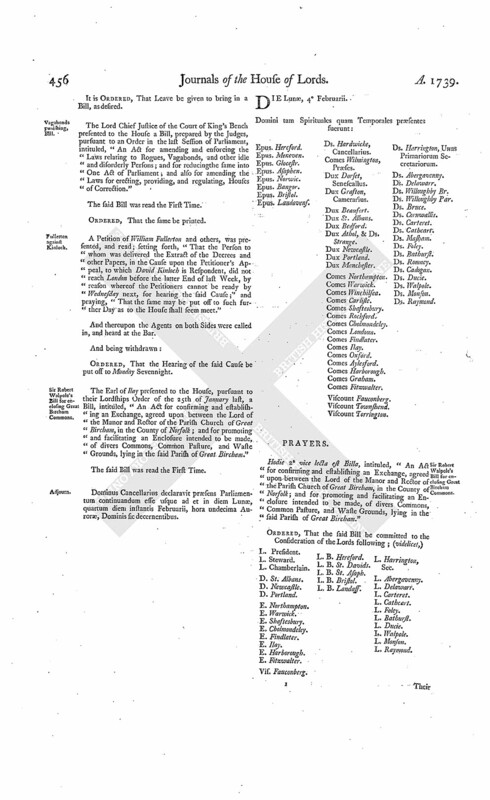 With a Bill, intituled, "An Act for repairing the Road between Hockliffe, in the County of Bedford, and Stony Stratford, in the County of Buckingham;" to which they desire the Concurrence of this House. Wallmoder's Petition, to be naturalized. 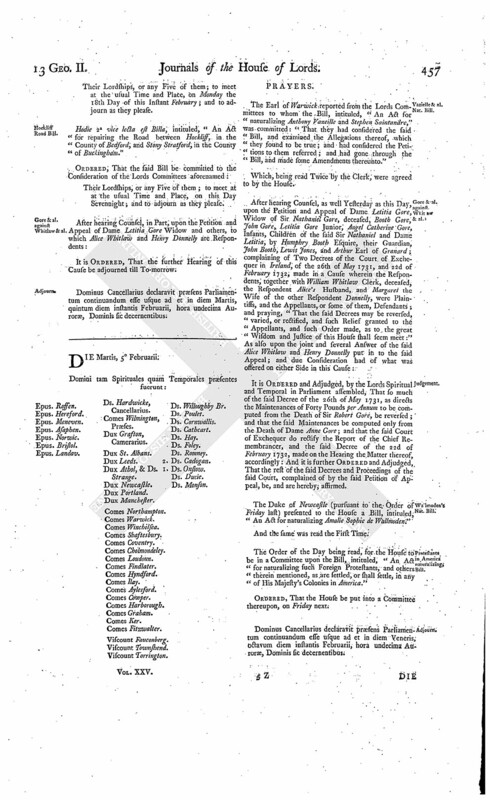 The Lord Chief Justice of the Court of King's Bench presented to the House a Bill, prepared by the Judges, pursuant to an Order in the last Session of Parliament, intituled, "An Act for amending and enforcing the Laws relating to Rogues, Vagabonds, and other idle and disorderly Persons; and for reducingthe same into One Act of Parliament; and also for amending the Laws for erecting, providing, and regulating, Houses of Correction." 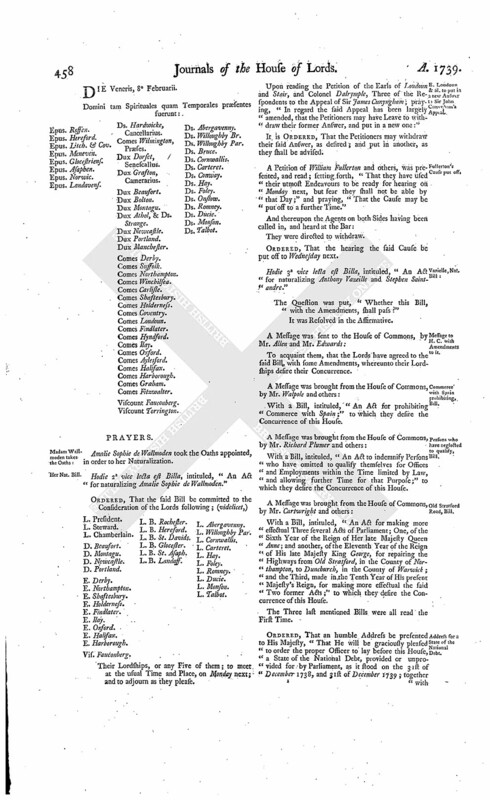 A Petition of William Fullerton and others, was presented, and read; setting forth, "That the Person to whom was delivered the Extract of the Decrees and other Papers, in the Cause upon the Petitioner's Appeal, to which David Kinloch is Respondent, did not reach London before the latter End of last Week, by reason whereof the Petitioners cannot be ready by Wednesday next, for hearing the said Cause;" and praying, "That the same may be put off to such further Day as to the House shall seem meet." Ordered, That the Hearing of the said Cause be put off to Monday Sevennight. Sir Robert Walpole's Bill for enclosing Great Bircham Commons. The Earl of Ilay presented to the House, pursuant to their Lordships Order of the 25th of January last, a Bill, intituled, "An Act for confirming and establishing an Exchange, agreed upon between the Lord of the Manor and Rector of the Parish Church of Great Bircham, in the County of Norfolk; and for promoting and facilitating an Enclosure intended to be made, of divers Commons, Common Pasture, and Waste Grounds, lying in the said Parish of Great Bircham." Dominus Cancellarius declaravit præsens Parliamentum continuandum esse usque ad et in diem Lunæ, quartum diem instantis Februarii, hora undecima Auroræ, Dominis sic decernentibus. Hodie 2a vice lecta est Billa, intituled, "An Act for confirming and establishing an Exchange, agreed upon between the Lord of the Manor and Rector of the Parish Church of Great Bircham, in the County of Norfolk; and for promoting and facilitating an Enclosure intended to be made, of divers Commons, Common Pasture, and Waste Grounds, lying in the said Parish of Great Bircham." Vis. Fauconberg. L. B. Hereford. Their Lordships, or any Five of them; to meet at the usual Time and Place, on Monday the 18th Day of this Instant February; and to adjourn as they please. Hodie 2a vice lecta est Billa, intituled, "An Act for repairing the Road between Hockliff, in the County of Bedford, and Stony Stratford, in the County of Buckingham." Their Lordships, or any Five of them; to meet at at the usual Time and Place, on this Day Sevennight; and to adjourn as they please. Dominus Cancellarius declaravit præsens Parliamentum continuandum esse usque ad et in diem Martis, quintum diem instantis Februarii, hora undecima Auroræ, Dominis sic decernentibus. The Earl of Warwick reported from the Lords Committees to whom the Bill, intituled, "An Act for naturalizing Anthony Vazeille and Stephen Saintandre," was committed: "That they had considered the said Bill, and examined the Allegations thereof, which they found to be true; and had considered the Petitions to them referred; and had gone through the Bill, and made some Amendments thereunto." It is Ordered and Adjudged, by the Lords Spiritual and Temporal in Parliament assembled, That so much of the said Decree of the 26th of May 1731, as directs the Maintenances of Forty Pounds per Annum to be computed from the Death of Sir Robert Gore, be reversed; and that the said Maintenances be computed only from the Death of Dame Anne Gore; and that the said Court of Exchequer do rectify the Report of the Chief Remembrancer, and the said Decree of the 22d of February 1732, made on the Hearing the Matter thereof, accordingly: And it is further Ordered and Adjudged, That the rest of the said Decrees and Proceedings of the said Court, complained of by the said Petition of Appeal, be, and are hereby; affirmed. The Duke of Newcastle (pursuant to the Order of Friday last) presented to the House a Bill, intituled, "An Act for naturalizing Amalie Sophie de Wallmoden." 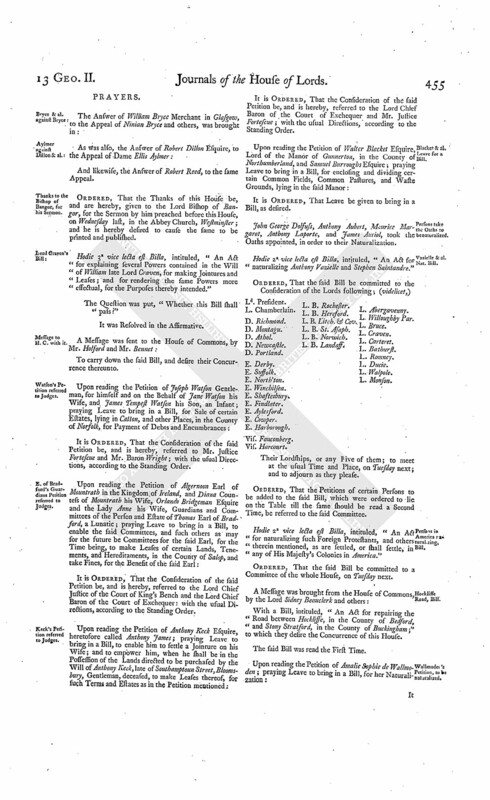 The Order of the Day being read, for the House to be in a Committee upon the Bill, intituled, "An Act for naturalizing such Foreign Protestants, and others therein mentioned, as are settled, or shall settle, in any of His Majesty's Colonies in America." Dominus Cancellarius declaravit præsens Parliamentum continuandum esse usque ad et in diem Veneris, octavum diem instantis Februarii, hora undecima Auroræ, Dominis sic decernentibus. Amalie Sophie de Wallmoden took the Oaths appointed, in order to her Naturalization. Hodie 2a vice lecta est Billa, intituled, "An Act for naturalizing Amalie Sophie de Wallmoden." E. Loudoun & al. to put in a new Answer to Sir John Cunyngham's Appeal. 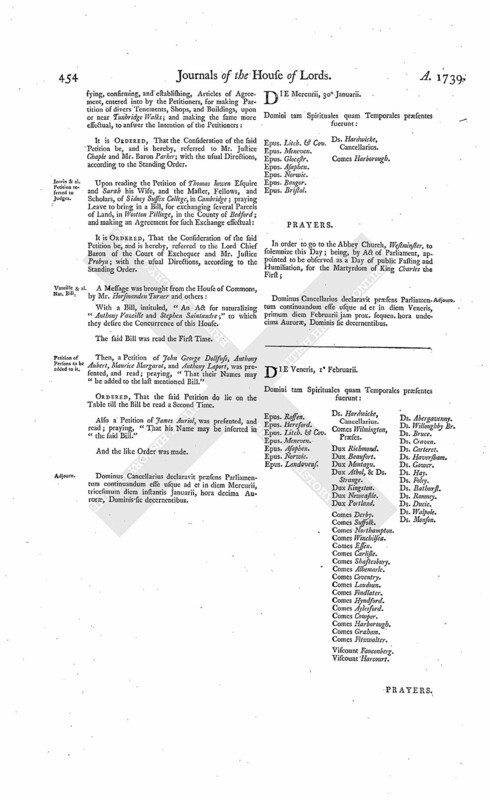 Upon reading the Petition of the Earls of Loudoun and Stair, and Colonel Dalrymple, Three of the Respondents to the Appeal of Sir James Cunyngham; praying, "In regard the said Appeal has been largely amended, that the Petitioners may have Leave to withdraw their former Answer, and put in a new one:"
It is Ordered, That the Petitioners may withdraw their said Answer, as desired; and put in another, as they shall be advised. A Petition of William Fullerton and others, was presented, and read; setting forth, "That they have used their utmost Endeavours to be ready for hearing on Monday next, but fear they shall not be able by that Day;" and praying, "That the Cause may be put off to a further Time." Ordered, That the hearing the said Cause be put off to Wednesday next. Hodie 3a vice lecta est Billa, intituled, "An Act for naturalizing Anthony Vazeille and Stephen Saintandre." To acquaint them, that the Lords have agreed to the said Bill, with some Amendments, whereunto their Lordships desire their Concurrence. Commerce with Spain prohibiting, Bill. With a Bill, intituled, "An Act for prohibiting Commerce with Spain;" to which they desire the Concurrence of this House. Persons who have neglected to qualify, Bill. With a Bill, intituled, "An Act to indemnify Persons who have omitted to qualify themselves for Offices and Employments within the Time limited by Law, and allowing further Time for that Purpose;" to which they desire the Concurrence of this House. 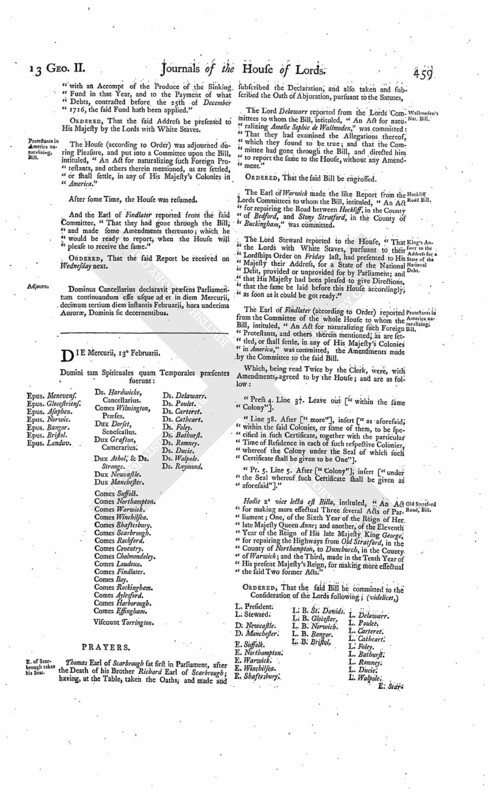 With a Bill, intituled, "An Act for making more effectual Three several Acts of Parliament; One, of the Sixth Year of the Reign of Her late Majesty Queen Anne; and another, of the Eleventh Year of the Reign of His late Majesty King George, for repairing the Highways from Old Stratford, in the County of Northampton, to Dunchurch, in the County of Warwick; and the Third, made in the Tenth Year of His present Majesty's Reign, for making more effectual the said Two former Acts;" to which they desire the Concurrence of this House. Address for a State of the National Debt. Ordered, That an humble Address be presented to His Majesty, "That He will be graciously pleased to order the proper Officer to lay before this House, a State of the National Debt, provided or unprovided for by Parliament, as it stood on the 31st of December 1738, and 31st of December 1739; together with an Accompt of the Produce of the Sinking Fund in that Year, and to the Payment of what Debts, contracted before the 25th of December 1716, the said Fund hath been applied." The House (according to Order) was adjourned during Pleasure, and put into a Committee upon the Bill, intituled, "An Act for naturalizing such Foreign Protestants, and others therein mentioned, as are settled, or shall settle, in any of His Majesty's Colonies in America." And the Earl of Findlater reported from the said Committee, "That they had gone through the Bill, and made some Amendments thereunto; which he would be ready to report, when the House will please to receive the same." Ordered, That the said Report be received on Wednesday next. Dominus Cancellarius declaravit præsens Parliamentum continuandum esse usque ad et in diem Mercurii, decimum tertium diem instantis Februarii, hora undecima Auroræ, Dominis sic decernentibus.